If moon’s Southern polar crater ice is confirmed it should lead to the discovery of life on the moon says a leading astrobiologist. 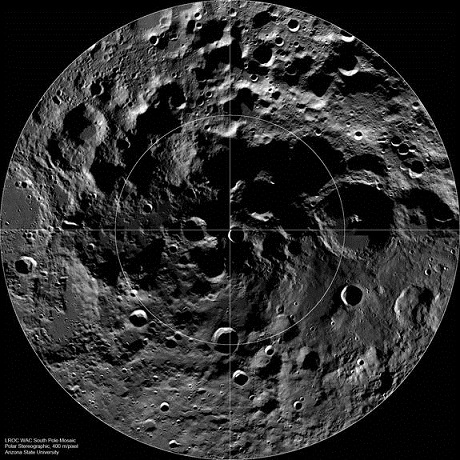 If Shackelton Crater on moon ice is confirmed certainly there should be a domain of subsurface liquid water and microbial life thriving in it said Professor Chandra Wickramasinghe of the Buckingham Center for Astro Biology. “If the water ice discovery is confirmed, we must take on board the idea that there is liquid water at some depth, and then bacterial life is mostly to be present. After all everywhere on Earth, even in total darkness, life is known to be present,” he told this correspondent responding to a query. Wickramasinghe is the prime proponent of the theory of panspermia that tells microbial life hitchhiking on comets and seeding planets and satellites in the universe. He was following up the report that scientists claim to have found new evidence which suggests that the largest polar crater in the moon may be alluringly rich in ice. 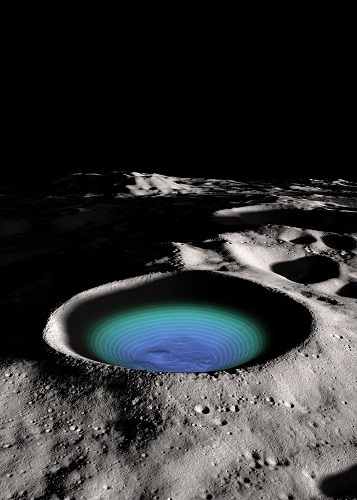 The interiors of polar craters on the moon are in nearly perpetual darkness, making them cold traps that researchers have long suspected might be home to vast amounts of frozen water and thus key candidates for human exploration. However, previous orbital and earth-based observations of lunar craters have yielded conflicting interpretations over whether ice is there. In the crater there should be large amounts of frozen water or as little as zero lead study scientist Mario Zuber warned. This uncertainty is due in part to what the researchers saw in the rest of the crater. Unusually, while the crater’s floor was relatively bright, Zuber and her colleagues observed that its walls were even more reflective. Now scientists who have mapped Shackleton Crater, which is more than 19 km wide and 3km deep (as deep as earth’s oceans), with unprecedented detail have found evidence of ice inside the crater. NASA’s Lunar Reconnaissance Orbiter essentially lit up the crater’s interior with infrared laser light, measuring how reflective it was. The crater’s floor is more reflective than that of other nearby craters, hinting it had ice, the scientists said..
“Water ice in amounts of up to 20 per cent is a viable possibility,” study lead author Maria Zuber, a geophysicist at the Massachusetts Institute of Technology, told SPACE.com. Don’t get your hopes up, though. She warned that there could be no ice at all. The amount of ice in Shackleton Crater “can also be much less”, researchers reported in the journal Nature. Scientists had thought that the existence of highly reflective ice should be on the floor of the crater than anywhere else. In comparison, the walls of Shackleton Crater occasionally see daylight, which should evaporate any frozen water that gets collected. The researchers think the reflectance of the crater’s walls is due not to ice, but to quakes. The meteor collision or earth’s pull generated moon quakes may be sloughing off darker top layer of the walls making it more brighter. This entry was posted on Sunday, June 24th, 2012. You can follow any responses to this entry through the RSS 2.0 feed. You can skip to the end and leave a response.